The Volkl 100Eight was new to the Volkl lineup last season, and essentially replaces the very popular Volkl Gotama which had similar dimensions. The 100Eight features a construction that Volkl calls 3D.Ridge which is a wood + fiberglass + carbon stringer variation of the lighter and more expensive V-Werks carbon skis. At just over 2000 grams per ski in the 189 cm length, the 100Eight is another ski positioned in the category of 50/50 skis to be light enough to tour on, but robust enough for full days of inbounds riding. 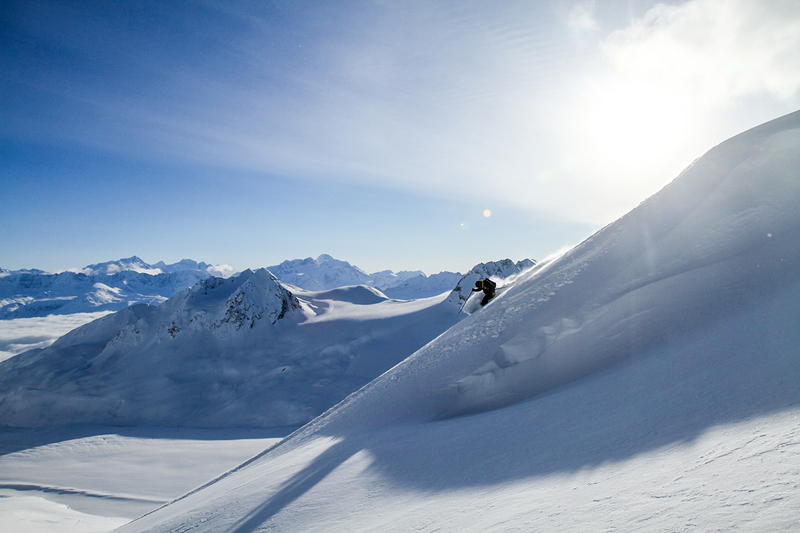 So to get a sense of their versatility, I’ve spent time on them over the past two seasons, primarily at Alyeska Resort and a bit of time when guiding at Chugach Powder Guides. The 100Eight is a pretty unique-looking ski. The “3D.Ridge” construction looks a lot like the V-Werks skis in profile, though the sidewalls are not as thin and the “100” series (100Eight and 90Eight) weigh a bit more. 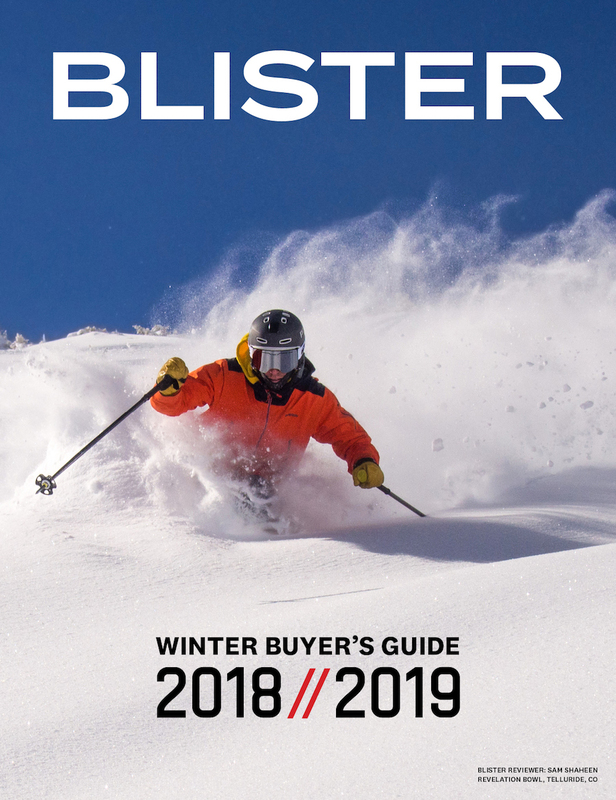 The rocker profile is long and gradual, but is more pronounced than other elongated rocker skis in the Volkl lineup (like the Mantra) but not as exaggerated as the 15/16 Shiro or Volkl’s One, Two, and Three skis. 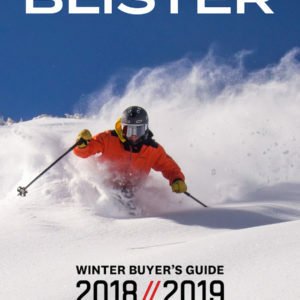 The sidecut radius / shape of the 100Eight is surprisingly lacking in early taper considering how many skis in this waist width have started to feature increasingly tapered tips — e.g., the Salomon QST 106, DPS Wailer 106 Foundation, or Rossignol Soul 7 HD). I’ll get more into this below, but it’s an interesting departure. I started at the recommended mount point of -11 cm from center, and never felt any reason to move from there. Despite its rocker profile and construction, the 100Eight performs and feels like a pretty traditional ski, and that mount point feels in line with the overall design of the ski. It wasn’t too long ago that a ski with a 108 mm waist was considered a superfat pow ski and, despite spending most of my season on ~120mm+ skis, I still get out on the skis like the 100Eight on pow days when riding lifts, touring, and heli skiing. Sometimes I underestimate the amount of snow; other times, I’m just in the mood for something a little bit skinnier and more prone to carve when encountering firm snow. In deep pow, the 100Eight provides adequate float, and its long, continuous rocker allows the ski to break free for slashes and drifts. At 200 lbs plus pack and gear, I can certainly get the 100Eight’s tips to dive under deep, light snow, but it doesn’t take much effort to keep them up and planing. In shallower pow where you still sink to the base, the 100Eight rewards a centered or even forward stance with cleanly carved turns and a fun, predictable ride. The skis feel quick and light underfoot, and quick turns are best achieved by flattening them out and pivoting on the fully-rockered bases. I tend to prefer damp, heavy skis in chop and crud, so did not have high expectations for the 100Eight given its thin, lightweight construction. But to the contrary, I found it to be the best lightweight mixed-conditions inbounds ski I’ve used. The 100Eight does have a speed limit at which point the skis start to fold up a bit when smashing through heavy maritime chop, but it tends to do very well up to that point. And I think a lot of this is due to the ski’s relatively long effective edge. 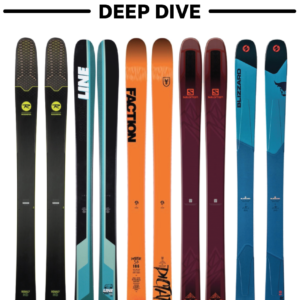 While it is a very different ski overall, the 100Eight reminds me of the 4FRNT Devastator in terms of its minimal tip taper, and a sidecut that seems to match the rocker quite well. As a result, when tipped on edge, almost the entire length of the ski engages the snow, and this holds true whether hitting patches of soft snow or crossing firm sections. As long as the ski is on edge, it is remarkably stable — especially considering its low weight. Just as in powder, quicker turns in tight terrain are best achieved by staying centered and pivoting on the fully rockered bases. And the light weight also allows the skis to be easily thrown around for jump turns. Of note, the times when the 100Eight feels least capable in chop (especially deep, heavy chop) is when running bases flat and straight lining. Here, the skis feel more prone to fold up or deflect when hitting bumps. And similar to other fully-rockered skis the 100Eight feels a bit nervous on firm, flat sections when skiing bases flat, off edge. It’s easy to mitigate — just get at least a light bit of edge pressure going when hitting groomers or sections of smooth, wind-scoured snow. The performance of the 100Eight in crud is very similar to its ride in shallow and deep chop, and everything I wrote above should apply. Keep the ski on edge, and it offers a surprisingly stable ride, even at relatively high speeds. The long effective edge tends to smooth things out quite well. But when running bases flat, the ski feels a bit more nervous and is more prone to deflection. 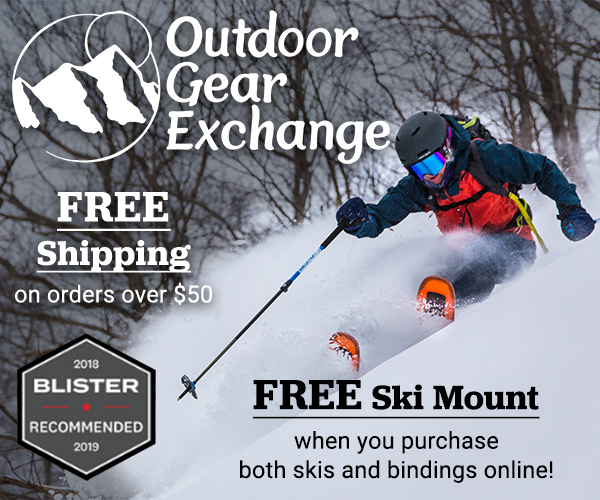 Now if you guys did a comparison with the Fischer Ranger 108 (another light powerful 50/50 ski) in the deep dive, I may actually make the dive and get a subscription! I am very interested in this ski. Seems like it could be a great one ski quiver. Not that I need just one ski. I am just a tad worried about sizing. For comparision here are all my skis and sizes. Keep in mind that all these skis seem to fit me very well for the intended purposes. So my concern is I think I am in between sizes. I feel the 181 might be a tad long but the 173 is definitely going to be to short. I am 5’7″ and weight 175 lbs. Let me know if you have any thoughts on sizing. Peter – the deep dive articles and access to Blister folks by email more than make the subscription pay for itself. They do so so much pro Bono it’s amazing. I still get 3 magazine subscriptions and not sure why except to get a laugh when comparing a garbage review to real reviews at Blister. Paul is speaking about a deep dive coming soon… but I cannot find it. Did they do this deep dive? Well…. Probably not….. Its also strange that this review can’t be found from the index. You’ll have to Google it…… Maybe this doesn’t exist either? 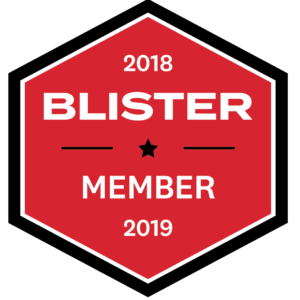 I’ve been looking for a quality review of the 90Eight and am BUMMED Blister doesn’t have one. 108 is IMO a little too wide for me as an everyday ski in the Sierras. 96-100mm is perfect – and a ~120+ pow ski for the fresh/chunder days. 90Eight is super versatile – I have two pair (AT and area), and they do everything I need unless the snow is bullet proof. Pull out Kendos for those days. Sorry to be quite pedantic, but I read a couple of reviews claiming that the new version is clearly better. Cna anyone bring some light on this? Just wanted to share some notes after demoing these at Snowbird recently. These definitely ski short. I demoed the 189 length and this was the correct length for me despite preferring 184-187 for a stated length normally. Dead easy to ski. Hand flex is very stout but you wouldn’t know it from skiing then – very easy to ski. I’m 5’11’’ 180-185 so my weight may have something to do with that. A little compromise when it comes to firm bumps or firm groomers but totally manageable. They do get pushed around in firm chop. Still, it seems like my skiing style is more well suited to this style of ski. I really enjoy my bibby’s in the 184 length but I wouldn’t describe my skiing style as wanting to charge/straightline everything, more playful, finesse and mixed turn sizes. The only change I would make is more tip and tail rocker for a less traditional look. Other than that they pivot really nicely. Easy to make short turns on cat tracks. Pivot really well in bumps. Much easier than moment bibby 184s in bumps and tighter terrain. 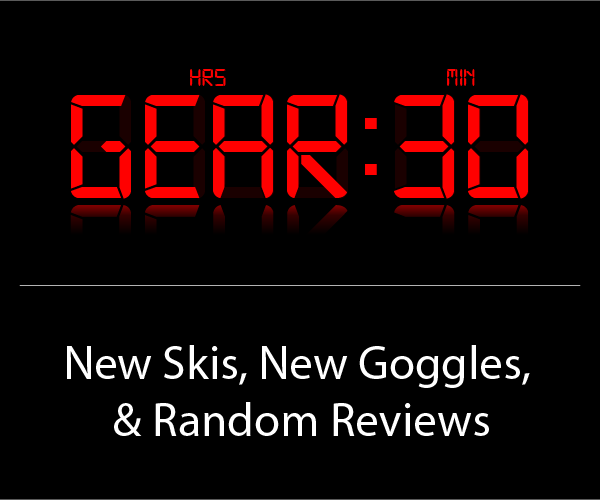 These are light so they may make sense for a 50/50 ski with shift bindings. Could potentially put a shift binding on these, get Salomon s/lab mtn boots and have a 50/50 one ski quiver. As stated in the review, as long as you don’t run the bases flat they feel plenty stable for how light they are. I’m currently loving my Devastators and am looking for a lighter 50/50 ski that mimics them as much as possible. These sound like a great option. Since I’m very happy on 185 Devis, would you recommend the 100eights in a 181 for touring?